Despite the fact that pigs are highly intelligent and very curious beings, the industry intensively confines them indoors to small pens with concrete floors and metal bars. Without natural stimulation, and under such crowded conditions, pigs often resort to tail biting, which can result in serious injury or infection. The industry has responded to this problem by removing piglets' tails--without anesthesia. Other unanesthetized mutilations commonly endured by the young piglets include castration and ear notching (for identification purposes). Most breeding sows live virtually their entire lives in highly-constraining metal stalls, which make simply turning around an impossibility. Under this perpetual confinement, anomalous behaviors such as sham-chewing (chewing when no food is present) and bar biting are common (Fraser & Broom 1990). Sows typically endure a continuous cycle of pregnancies until reproductive efficacy declines, at which time they are sent to slaughter. Pigs are transported to slaughter under overcrowded conditions because it is economically advantageous to transport as many animals per load as possible. For any journey less than 28 hours, they are given no food or water. The welfare of the animals is greatly compromised during this time, as is made manifest by the common “dead-on-arrivals.” At the slaughterhouse, pigs are hung upside-down by one or both back legs, their throats are cut, and they are bled to death. The Humane Slaughter Act requires that a stunning procedure be followed before this process, but inadequate equipment or lack of care in stunning properly can result in extreme pain for the animals (Fraser & Broom 1990). The methods of dairy and veal production are presented together because they are inextricably linked. Newborn calves are a necessary consequence of the dairy industry because cows must give birth regularly in order to produce acceptable levels of milk. 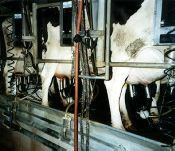 Within one to three days, a newborn calf is taken from its mother so that it does not consume too much of the milk which the industry intends for humans. Female calves are raised to replace older dairy cows, while male calves are used for their meat. Many male calves are raised and slaughtered for beef, but others are used for veal--either slaughtered within a few days for the low-grade variety, or confined to small crates for months to be raised for “milk-fed” veal. “Milk-fed” veal calves are actually fed only a milk substitute mixture which is devoid of essential nutrients such as iron. The borderline anemia brought about by this iron deficiency, combined with a complete lack of exercise (a calf cannot even turn around in its wooden crate) guarantees that the resulting meat is a tender pinkish-white, which is the quality of veal most appreciated by consumers. The bodies of modern dairy cows are heavily taxed. In addition to being forced to bear calves regularly, selective breeding and the use of hormones (such as BGH) to produce as much milk per cow as possible have deleterious health effects. Lameness and mastitis, an udder ailment, are both very common. With a plentiful supply of young cows to replace those with declining levels of milk production, cows are routinely slaughtered for inexpensive ground beef. In fact, although healthy cows can live for 20 to 25 years, our modern dairy cows typically are slaughtered after only a few years. Beef cattle usually are raised on range land for months to years before being rounded up for transport to feedlots. Unlike most other animals raised for food, range cattle can get adequate exercise and experience less psychological distress. Still, a number of abusive processes are commonly administered by ranchers, including branding, and unanesthetized dehorning and castration. Furthermore, range cattle are often denied adequate shelter to protect against harsh weather conditions. Most cattle spend the last few months of their lives at “finishing” feedlots, where densities are high and the terrain consists only of dirt and manure. Unfortunately, beef cattle endure the same transportation problems as pigs (see above). Even extremely sick animals are transported to slaughter rather than being humanely euthanized. These “downers” (as they are called by the industry) are still economically valuable, so an attempt is made to bring them to slaughter before they die because animals which die natural deaths cannot be used for human consumption. Since the animals cannot walk, they are usually dragged by chains or pushed with heavy equipment. Farm animals are specifically exempted from federal animal welfare laws, so downed animal trade is legal throughout the U.S.--except in the State of California, where new legislation requires that downed animals be humanely euthanized. Although they represent a small minority of the animal agribusiness, some traditional farms do still exist. These farms rarely can compete with factory-style agribusiness directly, so an alternative niche market has been established instead. Marketed “free-range” eggs, “sustainable” meats, and “organic” dairy products are derived from animals which are raised under better conditions than within the now-standard intensive system. (Is it not ironic that traditional farming is now “alternative farming?”) Unfortunately, traditional farming has never been cruelty-free, and these farms today are typically no better. The animals endure the same stresses of handling, transportation, and slaughter as their factory cousins. Furthermore, dairy calves are often still sold for veal production, free-range egg-laying hens are usually supplied by the same inhumane hatcheries that supply factory farms, and many chickens are still painfully debeaked. The consumer should be aware that terms such as “free range” are not regulated and are sometimes abused. The living conditions and amount of space for the animals varies considerably from farm to farm.